Create and present crisp charts, graphs and spreadsheets for use on your laser, inkjet printer or copier. Specially coated, clear transparencies issue sharp black images within 8-1/2" x 11" non-striped sheets. 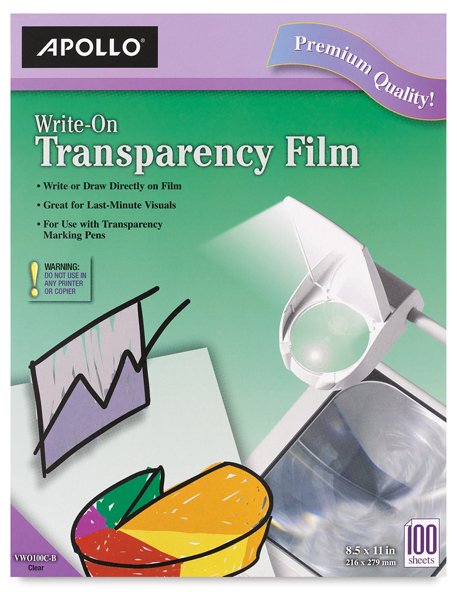 For those last-minute presentations or collaborative brainstorms, this is the perfect transparency media. Write or draw using transparency marking pens (not included) and save your ideas for future reference. This transparency film is not recommended for use in printers or copiers.